Big things are happening around here today - 1) I have a tutorial for you on how to add heat transfer vinyl to hats and caps (without any special heat press attachments) and 2) we have a very special guest blogger! I still can’t believe I’m here writing this tutorial for you (fan-girl moment!!!). I’ve been a reader of Melissa’s blogs since before Silhouette School even existed…I followed her on her old blog, Two It Yourself, and then we both happened to get Silhouette machines (she got her Portrait and I got a Cameo) at the same time and so *of course* I began following along when she started Silhouette School! I don’t have my own blog, but I make all kinds of things and have an Etsy shop, Little House Blue Door, where I sell my creations. 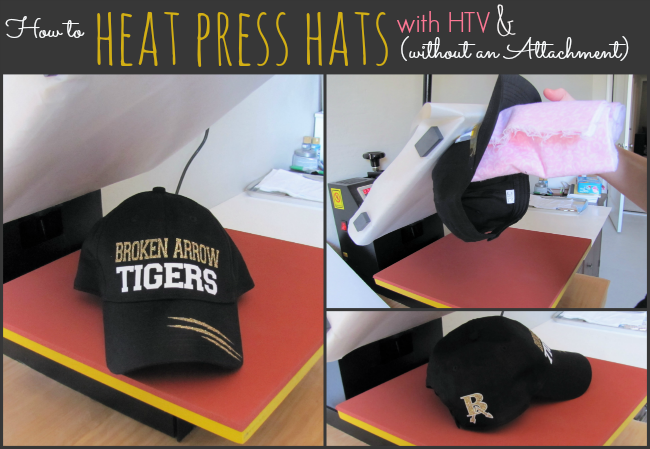 But now for why you're here - I’ve figured out a way to customize hats with HTV using my regular heat press (I have the same one as Melissa)!!! I know, I know, I did quite a happy dance when it worked and Melissa asked me to write up a tutorial because you guys have been begging for a how-to on this. Well, today’s the day! It all started when I saw this great video from The Rhinestone World where Matt was experimenting with putting custom HTV designs onto baseball cleats. I sat there for the entire 7:29 with my mouth agape and my mind spinning with ideas. I just KNEW that this technique would work for hats (and probably a ton of different things) with just a few tweaks, so I set out to do it and it totally works! Hat (I’m using a cotton hat, I’m sure trucker-style hats would work, just be careful not to melt them!) I found mine at Walmart in the women’s accessories section for under $3.00. Before you start, you need to know that this hack only works if you have your Teflon sheet attached to your heat press. I use the same magnet trick explained in this Silhouette School tutorial. Now that you have your heat press set up, you’re ready to start! I wanted a cute hat to wear to our local football games, so I put together a couple of different designs, one for the front, one for the bill, and one for the back. Get those sized the way you want and cut out on your HTV (remember to mirror your images) while your heat press warms up. Flocked HTV and/or glitter HTV is definitely recommended for this project. I tried it with regular HTV, but the seams on the hat showed through and the end result just doesn’t look as polished. The flocked HTV and glitter HTV are quite a bit thicker and cover up the seams really well. For this project, specialty heat tape will be your best friend. Because we aren’t pressing things the way we would a shirt or a flat project, it’s almost impossible to keep everything exactly positioned and you don’t want it to slip around. Heat Tape is great because you can use it to hold things you’re pressing and it won’t leave any residue. I found mine on Amazon and I’m still on my original roll over a year later. It lasts forever! After I cut and weeded my designs, I started with my front design. I wanted it centered on the hat, so I folded the htv design in half (non sticky sides together) and made a slight crease and then lined it up with the center seam. One trick I use constantly with HTV is to lay down a small Teflon sheet over my big gridded rotary cutting mat. You can see the grid through the sheet and the sticky HTV carrier doesn’t stick to the Teflon. It makes creasing your designs so much easier! Now move it onto the hat and center it with the seam. Grab your oven mitt or thick fabric and fold it over 3 or 4 times so it’s small enough to fit inside your hat. This will protect your fingers from getting burned through the hat. 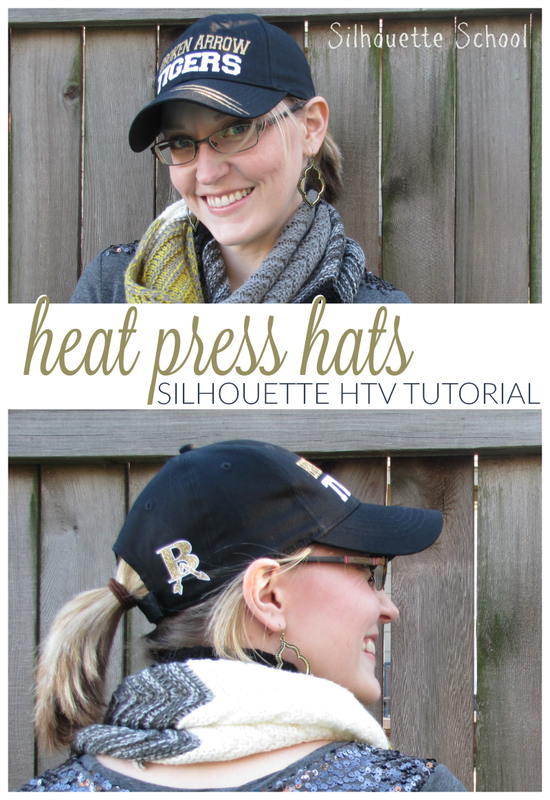 Since you can’t close your heat press onto your hat, you’re going to push your design as hard as you can against the hot plate of your press. Hold the hat on the top plate for 5-7 seconds. My design is a little bigger, so I had to do 5-7 seconds in each area to make sure everything stuck. Start in the center of the design and work your way out to each edge. This will help adhere your design in the true center and keep everything from shifting. Remember, flocked HTV is a cold-peel material, so make sure to wait for it to cool off before you remove the clear transfer sheet or you’ll end up ripping your design. Peel slowly so if anything isn’t quite adhered you can lay your clear carrier sheet back down and press it again. My front design has two colors, so I needed to repeat this process for the gold glitter. Crease design, line up on center seam, tape it down, grab your fabric/oven mitt, and press starting in the center and working my way out to each side slowly. Okay, the front is done, now for the design on the brim! I wanted some tiger claw marks off to one side and this just follows the same steps…place the design where you want it, tape it down securely, grab your fabric/oven mitt, and press it against the hot plate. I’m not sure what material is used inside the brim to stiffen it (cardboard? plastic? ), but exposing it to the high heat of the press flattens it out no matter what you do. If you like a curved brim like I do, just grab a large rubber band and wrap it around the brim as soon as you’re done pressing. You’ll want to do this while it’s still warm and leave it on until the brim is completely cooled. For the back I used the same technique as the front: tape my design down, fold up the thick fabric inside my hat, then use my hands to press my hat onto the hot plate of the press for 5-7 seconds or until it was well adhered. Even though this part was smaller and I could do it in one press, I still only held it for 5-7 seconds because I was layering HTV and didn’t want my first layer to shrink from being pressed too long. If you aren’t layering colors and you can get the entire design in one shot, you will want to hold it 10-12 seconds to make sure it’s securely attached. One more thing to keep in mind with flocked and glitter HTV is that both of them perform best when they’re the “top” layer. For the back image I made sure to put my white flocked HTV on first and my glitter HTV on last. There shouldn’t have been a place where they overlapped because of the way I cut them. However, if they happened to a little bit, the glitter will adhere better to the flocked htv than the other way around. This is just something to think about as you’re designing and assembling your hat. A special thanks to Rachel for sharing her secrets with us today on Silhouette School! Be sure to visit her shop Little House Blue Door and her Facebook page! on Etsy and on Facebook! YAY! Love this tutorial. I finally broke down just last night and ordered the same heat press and am so excited to know I can do a hat too and not have to shell out more money for another machine that will take up space! Thanks for the tutorial! Great tutorial... where did you buy the magnets? I myself have ordered the same press!! Maybe Melissa should start getting a "cut" of their profits!! LOL! Love this tutorial! I have a friend that wants five hats so this came just in time!! Thanks for sharing ladies!! This is awesome, and your hat is stunning. Thanks so much my son has been dying for me to make him a special hat now thanks to you I can, this is awesome!! Another OKIE!! Just got a Silhouette so I am a little late to the party. What press do you guys use? I am in the market for one! OMG! Thank you, thank you! So excited to get started! can i use shirt transfers and an iron for baseball hats as well? where can i purchase the heat tape? i googled and of course everything but what i want is showing up... am i not using the right keywords? What type of heat press do you use? Can you provide a link to purchase?